Before I chat with you a little about speaking your mind — especially if you’re a blogger who is feeling the pressures of life and considering ditching your blog — I have a few things I want to mention. So in a moment, we’ll chat, but first, I have an admission, a suggestion and an improvement in my life to mention. It’s something for everyone, really. It Was Too Many, Wasn’t It? For the last three weeks, my second post of the week has been a guest post, and that’s a bit much, isn’t it? I have an open door policy regarding guest posts, but I think I’ve lost a little momentum here, and I think all those guest posts are part of the reason. Still, I can’t say which I would have eliminated. All of them were great and all were pretty well received, so perhaps I’m just being overly critical of my approach to maintaining this community over the last few weeks. What do you think? It reached 100 degrees in some parts of North Texas this week. With temperatures sometimes in the 90s a couple of days and wildfires raging in the next county over, I’m already thinking about summer. Since I manage quite nicely in my simple little home without central air conditioning — even in the hot Texas summers — I thought it might be time to point my new readers in the direction of my post from last July about minimalist air conditioning. I mentioned it recently, but it never hurts to mention it again. Have a look at it if you don’t have central air conditioning in your home. Comments are still open on that post — and all my others. One unintended benefit of my recent decision to discontinue trash service is that I’m starting to recycle more. I’ve told you before that I don’t recycle much because it’s silly to drive out of my way — wasting gas and time — to recycle. It also would have slowed me down during my yearlong decluttering event. Now, however, since all of my home’s waste leaves by car, I might as well recycle what I can. And even better, it’s getting easier to recycle around here. There are paper recycling containers in a nearby Walmart parking lot and out front of a church I pass once a week, so I’m recycling paper now. That’s one more step toward a more intelligent version of my simple, deliberate life. Are you recycling as much as you could? Now, to the other bloggers who read this blog: Let’s chat a bit. This week, I’ve heard of several bloggers who are either throwing in the blogging towel, changing the focus of their blogs or putting their blogs on indefinitely hold because they’ve lost interest or confidence in their blogs. Life is always changing, and no blog will be around forever. But when the busywork of life is consuming more time than it once did, your life may be poised to go out of control. Here’s a fact: A simplicity blogger or minimalist writer who is too busy to write his or her own blog posts (see It Was Too Many, Wasn’t It? above) may not be living a very simple life after all. Here’s another fact, though: Blogging an optional activity. If you get bored with it, stop. If it takes time away from things you like more, stop. If it seems like work, stop. If it’s tedious, stop. If it’s boring, stop. 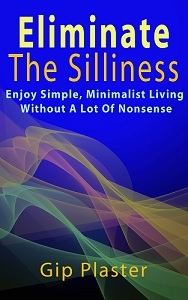 Nothing is more exciting to me, though, than sharing my journey toward ultimate simplicity with you. And when you join the conversation here and help me and So Much More Life’s other readers define and redefine our thoughts on a topic, you’re contributing to life’s highest purpose, the exchange of ideas. If you have something to say, please find time in your life to say it somewhere. You see, whether you’re a blogger or not, speaking your mind is an important part of living simply and deliberately. The world will be just fine without your voice, but it will be better with it. Glad to hear that you love your blogging. I’m still quite new to it all, just started at the end of last year, so it is very exciting. I enjoy the conversations, the discussions, and being able to share my thoughts and my ideas across the globe. And to learn from so many people as I read their blogs and indeed the comments that they share on my posts, is truly an amazing thing that is offered by this technological age. I think that if blogging is something that you truly love, and not just something that you are doing as means to … whatever, then your reward will always be the satisfaction that it brings. We’ll see in the times to come- if I’m right or if I’m very wrong. I really do like blogging, and I have no specific agenda at the moment, which is rather nice. I have some ideas for the future, but nothing is set in stone. Some of my commenters do their best work in my comments section. I’m beginning to think that commenting is a separate art from blogging and that some people excel at it. Thanks for being the first to sound off on today’s post. I’m glad you’re here. Gip, my life is in no way minimal at this time and my blog didn’t even really start out as a minimalist blog per se. It was more of a place for me to talk about the changes in my life and my desire for a more minimal or freer life. I have met so many wonderful people and gotten so many awesome ideas from the people in the minimalist community, but I must admit, I did feel a bit of a fraud. I am working everyday towards a more minimal lifestyle though, trying to set up my life so that I do not have to work 40+ hours a week and to do that, my goal was to get at least one business off the ground that I could manage on my own time whenever I wanted to. Unfortunately, in the meantime, I have a lot of debt to pay off, so I must keep my FT job, while working on all these business ideas. The blog started out as a business idea, but turned into more of a personal, social thing. This is NOT bad at all, but when I am trying to focus on my goals, it gets a little distracting and next thing I know, I am spending 20 hours a week reading and commenting on blogs, writing my posts, writing guest posts, planning my blog, etc. It gets to be too much when you have a FT job, 2 side businesses, a social life, trying to start a family, AND getting rid of my crap haha. I enjoy blogging, but at this time in my life, it doesn’t fit. I hope to return to it soon when things settle down, but I’m not getting any younger and I need to move some things forward with great velocity. Anyway, that’s just my story. Sorry its so darn long, but I felt I needed to explain my hiatus. You’re definitely not a fraud Marianne! The very fact that you wish to simplify your life at some point means you’re in the right (blog) company. Think about it, many people aren’t even aware that voluntary simplicity or minimalism is an option. Don’t feel bad about taking the time that you need to move your plans forward. I appreciate you taking the time to explain your decision here on my blog. I hope you’ll continue to be a regular commenter here and on the other blogs I read. It’s good to have you here. I forgot to answer your question about too many guest posts. I personally don’t think guest posts are a bad thing at all. I wouldn’t worry about that at all. When I see more than one guest post per two weeks on a blog, I think the blogger has run out of steam/ideas/interest/momentum and is using the guest blog format to regain some traction. I like reading guest blogs, but the reality is that I subscribe to any given blog because I like to read what that blogger has to say, not the sometimes lightweight thoughts of a lot of other folks whom I would not go out of my way to read. But having said all that, I would rather see guest blogs than nothing at all for long stretches of time on a blog. One would hope, then, that the blog owner would curate carefully the quality of the guest material s/he offers in place of their own work. Curate is good word choice, and I think I need to do more of that. Guest posts are necessary parts of blogging because a blogger sometimes has to offer them to get guest post slots in return. But I don’t tend to read guest posts on other blogs, so that probably says something. I’m reminded of Zen Habits. I used to read Zen Habits all the time, because I liked what Leo wrote – then he switched to what seemed to be a steady stream of guest posts. That being said, a guest post every couple weeks isn’t bad. A guest post every week isn’t even necessarily bad – but I think it has to be in proportion to your regular posts. I would like to go on record as stating that I do *not* plan to quit blogging any time in the foreseeable future. 😀 So people can feel free to head on over to my blog and check it out! Robert does a good job, so I suggest checking out his blog. It’s been months since I’ve read Zen Habits. Leo wrote good content, but it just isn’t for me anymore. I hope he still sometimes writes something himself. Honestly, until you pointed it out, I didn’t notice which posts were yours and which were guests. To me it doesn’t matter how many posts are guests post versus the blog author’s posts, as long as the content is interesting. And your posting frequency isn’t too much for me, nor do I ever feel like your posts feel like they are reaching (meaning the posts that feel like they were written JUST so the author can adhere to a particular schedule). I have a little blog, it’s never been popular and I’ve never been able to keep a regular schedule. It started as a place for me to keep cool decor stuff I found so I could find it again. Until this week I hadn’t posted for six months. Didn’t have time, didn’t feel like it so I didn’t. Talking to one’s self does get tiring and since I spend all day at work on a computer, I’ve been trying to stay off it more outside of work. Recycling…oi. This is a sore point. I feel guilty for contributing more trash to the planet than I should, but like exercising more, going to the dentist and eating less candy, I can’t always make myself. If my neighborhood offered curbside recycling, even for a fee, I would gladly pay and recycle more than I do. I would love for someone to haul my recyclables away every week. As it is I have to store recyclables, which looks cluttered, cart them to a dumpster that while only 2-3 miles away, is not on my regular route to anything. I also wait until I have a full carload to go, which means it’s a chore to load and unload, and half the time all the recycling containers are full when we go. So sometimes when I’m lazy and all my recycling containers are overflowing, I throw away recyclables. I feel guilty, but really, I hate recycling at home. At work it’s so easy it’s no problem. I don’t feel guilty about recycling less than I could be, but I do try every day to become a better citizen of the world. Some days I don’t try very hard, though. Tuesday and Fridays are my current posting schedule, and that seems to be working okay. I try to always present new information Tuesday and offer guest posts, posts related to older posts and more casual posts on Fridays. It seems to be working out. Hey Gip! I’ve been feeling a little down about all of the bloggers I’ve built relationships with deciding to leave their blogs too. But, I completely understand their individual reasons for doing so. It just proves that you can connect with people online. I mean, how else would there be such a void when they’ve disappeared? That said, I’m not going anywhere (sorry, you’re stuck with me!). Right now I can’t even imagine my life without blogging. It has grown into my favorite pastime, and a great source of pleasure for me. It’s hard to believe all of the amazing people I’ve connected with through blogging. I can’t wait to see what’s to come! Blogging is certainly more fun and entertaining than playing card games on the computer or doing Ranchtown or whatever it’s called on Facebook. I really don’t understand that game. I’m not going anywhere either, by the way. I’ve just been on holiday and it seems I’ve come back to something of a mini blog exodus!! It would be nice if people could write a little post on their blogs before skipping out, just so we know what’s happened and don’t have to pick up the pieces here and there on the grapevine. This isn’t a dig at anyone and thanks to Marianney for sharing her decision. But there are obviously others and do I just keep going back hoping that they might start up again or move on? It’s a bit sad when you’ve been reading about someone’s life for a while to just be confronted with an old post that never changes. It is interesting how some people post regularly for months, then disappear without a trace. As I said in the post, no one is obligated to blog, but it make sense that people who were once so involved in blogging would tell their readers when they plan to quit. It’s also amazing that a life can change so radically and unpredictably that a person who once blogged regularly no longer has any interest in it at all. I hope your holiday was great. I’d like one of those soon too. Hey Gip, I guess I am one of those that have re-framed their blog. I have come back from a break because I felt too much pressure to keep writing. I agree that if you don’t enjoy it just stop doing it. That is what living a simpler life is all about. Freeing up your time to do the things you really do enjoy. Thanks for stopping by my blog I appreciate it. Talk to you later. Thanks for joining the conversation here, Justin. I saw something about how you were reinventing your blog in one of your comments on another site. So many bloggers feel like they must keep blogging for the sake of their followers, but any activity that takes away from joy instead of adding to it should be discontinued. Yes, that’s what it means to live simply.